Browse comprehensively at this Stressless Comfort Zone Master Display. Almost everything and anything you need to know is aggregated for one-stop shopping. 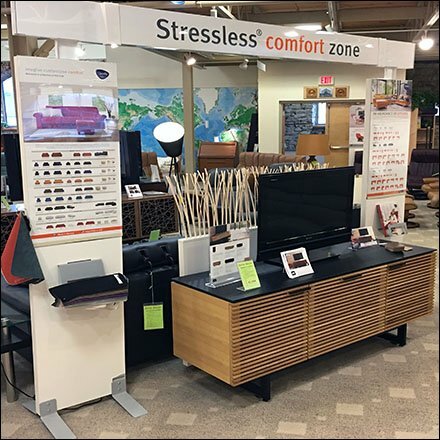 And this Stressless Comfort Zone Master Display is large enough to capture attention from anywhere in store. Consider the display details in the gallery of images including comprehensive guide to all Stressless furniture styles and sizes.. Seen at Dane Decor, Downingtown, Pennsylvania.